Cyberdating is a huge business and one which has been around for quite some time. In fact, by the year 2007, cyberdating already accounted for a multi-million dollar business and was expected to reach close to a billion dollars by 2011. But what is cyberdating and how exactly did the whole thing get started. Also, is it safe and what are the pitfalls of it. Cyberdating began to take off in earnest right around the time the World Wide Web was created. In 1995, Match.com became the first online dating service. It offered a revolution in dating circles, moving people away from the old lonely hearts personal ads and onto a searchable, always available and fresh database of people who were interested in meeting someone. Since Match.com, online dating or cyberdating has expanded to fill virtually every niche imaginable and allow people of similar interests to contact each other. While broad based services like the original Match.com will always be around, today one can find online dating services for virtually every religious group and virtually every subset of humanity. From Jewish to Muslim to Catholic, from gay to chub seekers to fetish seekers, there is almost inevitably at least one and sometimes several websites devoted to helping people of similar interests connect. While people may still look at pictures on online dating sites to decide if they are interested in meeting someone, more and more people are also actually reading what someone else says they are looking for and or what they are interested in. This allows for people to avoid the awkwardness that comes from learning, for example, that one is a staunch vegetarian and PETA activist while the second is a gun toting hunting enthusiast who advocates for the NRA. 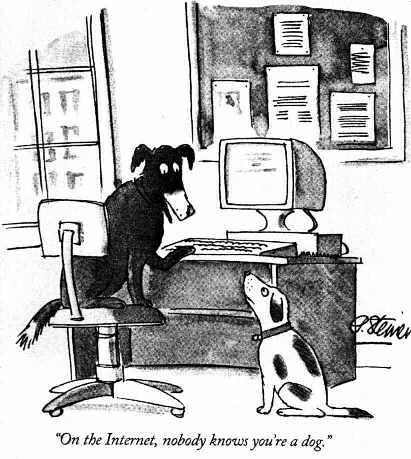 A famous cartoon in the New Yorker shows a dog sitting at a computer and typing. The caption reads, “On the Internet, nobody knows you’re a dog.” Unfortunately, this attitude has taken shape on the Internet and today people often lie about themselves in their online profiles, offering pictures which are out of date, shot creatively and sometimes of someone else completely. It is also not uncommon for people to tell tall stories about who they are when they publish information about themselves on cyberdating websites. By all accounts, cyberdating will be around for the long haul. With the advent of social networks like Facebook and MySpace, more and more people are taking their relationships into the virtual world instead of the real world and this trend is likely to continue accelerating for as long as the Internet exists. New York Times: Time for Facebook? Hammer, Eric. "What Is Cyber Dating?" Dating Tips - Match.com, https://datingtips.match.com/cyber-dating-6388488.html. Accessed 24 April 2019.